Broomall, PA (February 6, 2007): Pennsylvania Crusher offers three models of single roll crushers: the Hercules, the Atlas, and the Type K. All have a roll assembly consisting of a roll shaft and a fabricated roll shell with integral fixed teeth which operates against a breaker plate. This produces three different methods of reduction: impact, shear and compression. Applications for the these models include petroleum coke, gypsum, coal with rock, aggregate, limestone, chemicals, phosphate rock, shale and many other minerals. These are crushed at low speeds and therefore tend to facture along natural cleavage lines, resulting in minimal fines. Single roll crushers have a low profile and are relatively compact, allowing them to easily fit into tight places such as beneath dump hoppers. The Type K is best suited for the size reduction of coal, petroleum coke, and similar materials. The Hercules and Atlas models are for materials with higher compressive strengths. All three models may be choke-fed from hoppers or may be fed at continuous, controlled rates from vibratory screens, apron feeders or conveyor belts. All three models have very large feed openings, enabling them to accept large slabs. The curvature of their breaker plates ensures that no large slabs of material can simply fall through the chamber without being crushed; all will be retained within the crushing chamber until crushed to the proper output size. Their breaker plate assembly is formed by attaching curved, wear-resistant, steel breaker plates to a rugged frame formed of structural steel shapes. The roll assembly is fabricated as a single piece, with welded-on teeth. This eliminates any chance of the teeth coming loose from the roll and causing damage within the crushing chamber. Foundation requirements for all models are minimal. Since all operate at low speeds, dynamic loads transmitted to the foundation are relatively low, making them relatively easy to mount at any level, on suitable concrete or steel structures. It also means that a massive supporting structure is not necessary. For full details, log on to, www.penncrusher.com/Size_Reduction/Models/Single_Rolls.cfm, or, contact Lee Doyer, vice-president, sales & marketing, Pennsylvania Crusher Corporation, 600 Abbott Drive, Box 100P, Broomall, PA 19008-0100; Phone: 610- 544-7200; Fax: 610-543-0190; E-mail: buster@penncrusher.com; www.penncrusher.com. 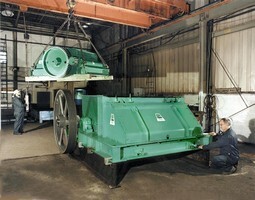 A) Single-roll crushers undergo final inspection at the Pennsylvania Crusher factory. B) Low profile enables Pennsylvania® single-roll crushers to fit in places where headroom is limited. C) Illustration explains the three reduction actions of a single-roll crusher. D) View from above; breaker plate is to the right. E) Teeth are welded to the roll shell, forming a very rugged and secure one-piece assembly. Can Crusher captures liquids and gases. Tertiary Crusher outputs 35-44 tons/hour. Granulator reduces size of rubber bales.